It is such a great blessing and privilege to be a child of God. To be redeemed, to have the Lord Jesus as Saviour and Friend has been a buffer against the knocks and disappointments of life. Sometimes it makes me wonder how the unsaved cope. On many occasions, one visits a Christian that has faced a misfortune or other traumatic experience and expects to see them broken and devastated, only to find them strong, offering hope and encouragement to others. A sister just told me that her bishop slept in the Lord two months ago. He and his wife of many years were inseparable. As a result, his flock feared for her wellbeing afterwards. Even the man of God had said before his departure that his concern was for his wife and not for himself. To everyone’s surprise, she has been cheerful, has never missed church and has preached on several occasions, something she hardly ever did in the past. Similarly, in June 2008, my youngest brother went to be with the Lord. That made two family members that I could no longer enjoy their company this side of heaven, my mum having departed three years earlier. Although it hurt for a while and I still miss them, I wasn’t devastated by those incidents. Over two thousand years ago, Jesus walked in our shoes. He took on a human body to pay the debt for our sins. He had many followers and some of them professed much love for Him. They called Him Master. Peter, who was like the chief of the disciples had declared Him to be the Christ, the Son of the Living God (Matthew 16:16). Sometime later when the Lord explained how He would be arrested and tortured and everyone would abandon Him, Peter and the other disciples insisted that such a thing would never happen (Matthew 26:30-35). Talk is cheap, they say, because when the rubber hit the road, what the Lord predicted was exactly what happened. In his time of agony and trial, everyone, including Peter, fled for their own safety. They left Him to face the ordeal alone. But Jesus didn’t place His hopes on man but on His Father in heaven. “I am not alone because my Father is with me.” That is the key to bearing up under whatever we are going through and pulling through by God’s grace. We need to have that unshakeable assurance if we love the Lord and are living by His word, that He is always with us. His promise is sure and His presence will abide with us forever. The scriptures used in this post are from the English Standard Version of the Holy Bible. God's love is the greatest love. Indeed, it is! Bless you, Diana! This is highly inspiring, I really love it! Glory to God! Hope you are fine, Ozor. I wish you a great time and God's favour during your hols. Cheers! God bless you superbly, Tammy, and surround you and yours with the beauty of His presence always in Jesus' name. Thank you for the comfort in those words..God bless you for your strength through difficult times.and may this be a comfort to many lives..
Amen and amen. It's been a while, Rita. Will visit you soon. Stay blessed and rapturable in Jesus' name. He alone is worthy of our praise and honour. God's abundant blessings on you amd yours, Temitope, in Jesus' name. You're right. Bless you, Ifunanya! Talk is indeed cheap. We often talk about what we will do in difficult situations but when they come we cower. The Lord is our strength. Amen. In Him, we can find ourselves and develop blodness. Cheers, Ononso! Praise God! It is well with you, Lovelyn! Amazing piece...u keeping wowing me ma. This definitely strengthens my faith. Praise God! You are favoured in Jesus' name. I'm inspired. indeed his favour is eternal. Thank you. God bless you, my dear! Call upon his name, he will answer us and show us great and mighty things which we do not know. He said that we should call upon his name in distress and he shall answer us and set us in a large place. These are the words of the Lord and they have kept me moving on. The Lord is really good all the time. It is obvious that God loves us so much that he wouldn't leave us or forsake us. His word is always there to keep us in the hour of temptation. It is indeed the hope of the righteous. Amen. God indeed will never leave nor forsake His own. He is too faithful to fail. When Christians are faced with challenges and it looks as if God is far. They only need to pick up His word and study again; there will be comforted and experience His wonderful presence. I have been inspired by the illustration used in this piece and the human interest examples given; all together to give it a beautiful piece for encouragement of readers and i am inspired. Thank you ma. God has a way of blessing, caring and staying close to his own people like he promised in the scriptures. He cannot possibly forsake us. Some may not understand and may cause them to despair. But He gives us the strength to forge ahead and be stronger. 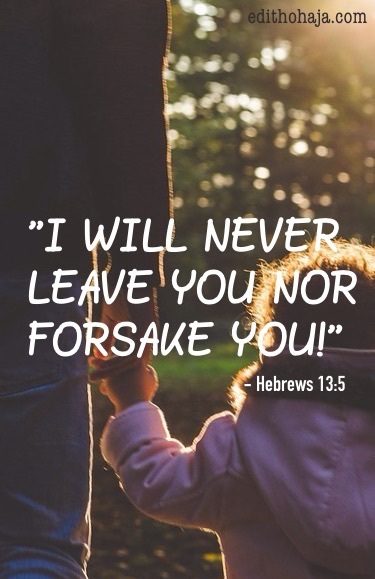 We have a loving Father who is always close to us, How can we be left alone or forsaken? Wow. God's promises never fail. When ever I face difficulties his promises always comforts me. There's great gain serving the lord. God bless you ma. God is indeed always with us. When my mother died, I thought that was the end of me and my siblings because her death meant we were orphans. I cried so hard the first day and I never wanted to eat again. But alas the the second after her death I ate. I didn't cry anymore. I felt comforted in my heart like nothing happened except for the fact that family and sympathisers flocked our home. I felt this inner peace because she suffered a lot before sleeping in the slord from illness. God is indeed with us. He gave me an d my siblings comfort to bear the loss and live even after we died inwardly. God is indeed with us because I was orphaned at an early age, being the last child I always wondered how I could leave without the love and care of my mother. But the kind of strength that Lord gave to my elder siblings have really shown me that he is indeed with us. Never a day have I lacked both financially and otherwise because the Lord have through my siblings been making life a great one indeed for me. This post is a constant reminder for me of God's unfailing love. 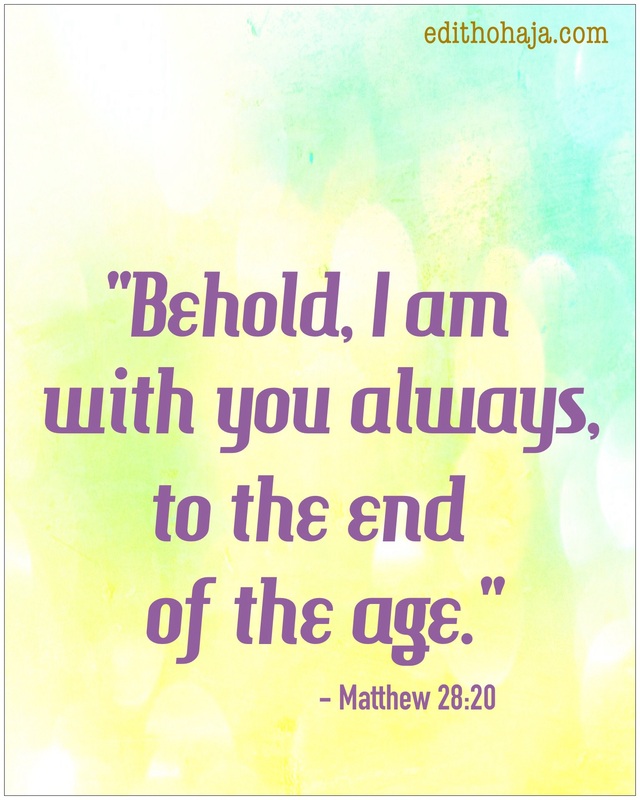 He said he will never leave us nor forsake us, in his hands he will hold us and in his arm she will fold us. He is our Redeemer , he will always care for us. What a beautiful name he is, the sweet name of Jesus. This is one of the promises God keeps fufilling in our lives. He is indeed a good God. This is true ma and highly inspirational. Just like when i lost my grandma. I thought my mum was not going to survive it but God showed up and gave her peace and she found joy and strength in the lord.. thank God for God.. this is hope lifting m. Thank you. God loves us, we are his children. Even though we have sinned and fallen short of his glory, he still wants us back. All we need to do is confess him as our lord and personal saviour. When it looks like we wont get through a situation, God always stretches his mighty hands. He is ever faithful and loving. Every situation we think we cant overcome has been taken over by God and in him we have strength. God's love is forever abiding. God never forsakes His own.. We should have that understanding, whenever we may find ourselves in situations that asks ''where is your God'. Knowing fully well that He is aware and will never forsake us. Thank God for your Wisdom. Reassuring words from our Father.. at the point of crossing the rubicon after loss of hope, it is sweet to know he will never forsake us. No situation will make God leave us. Halleluyah. God is our creator and he has promised never to leave us. if he can take care of the birds of the air and the fishes in the water, what more for we his children created in his image and likeness. We should also remember that we have a role to play in this promise. That role is to always do his will and obey his commandments. By so doing, we are assured of good relationship with him and take everything that happens in our lives as part of his plans for us. God never forsakes his children, his love for us is unending and eternal. His name shall ever be praised amen. This is too good and motivating ma, Our God is a great lord, he never leaves nor forsakes us, he is our great companion ever, he never fails his promises to us , always do good to please him. The lord has given us all fortifications & forcefields needed which has made us Forcefilled to be able to combat diabolicalness. God's love is the greatest of all. He that sent the Holy Spirit to lead us in all our ways, lest we dash our feet against a stone. He has promised to guide us,to go before us and bless our going out and coming in. May his name be praised. In 2012, I lost a dear one, an elder brother. I never thought that I will bear it. God has a way of consoling his children. All we need is to stay close to God and find solace in his abundant love.